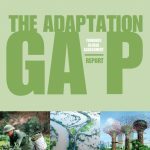 The report also features several country cases from the development of adaptation M&E systems including in South Africa and Cambodia, which were supported by GIZ on behalf of BMZ. A video summary of the report is available from UNFCCC Adaptation Exchange. GIZ’s Timo Leiter from the project “Effective Adaptation Finance (M&E Adapt)” is lead author of chapters 2 and 4 of the report, underscoring the expertise of GIZ in the field of Adaptation Monitoring and Evaluation (M&E). Further Information on Adaptation M&E is available on AdaptationCommunity.net and the Adaptation Gap Report is available from UN Environment.